You guessed it, we did make it to Big Bend National Park! 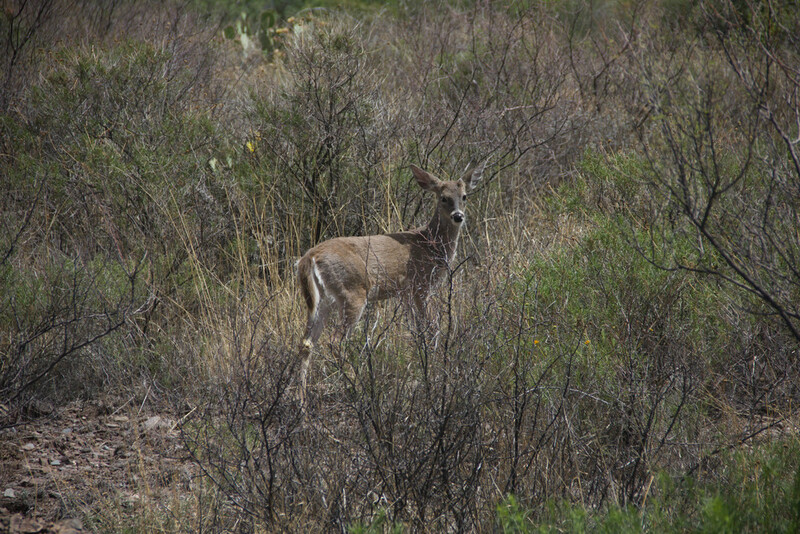 A big motivator was that Marfa really didn't have much to offer to keep us occupied. To be perfectly frank, Marfa was a disappointment plus dust. So we were happy to pack our stuff back up, grab two free cups of coffee from the office and head out on to our next adventure. Once again we passed through Alpine gassed up and continued until we found route 385 which was going to take us South (past a Border Patrol check point) to the entrance of Big Bend. Whitney wasn't feeling well. 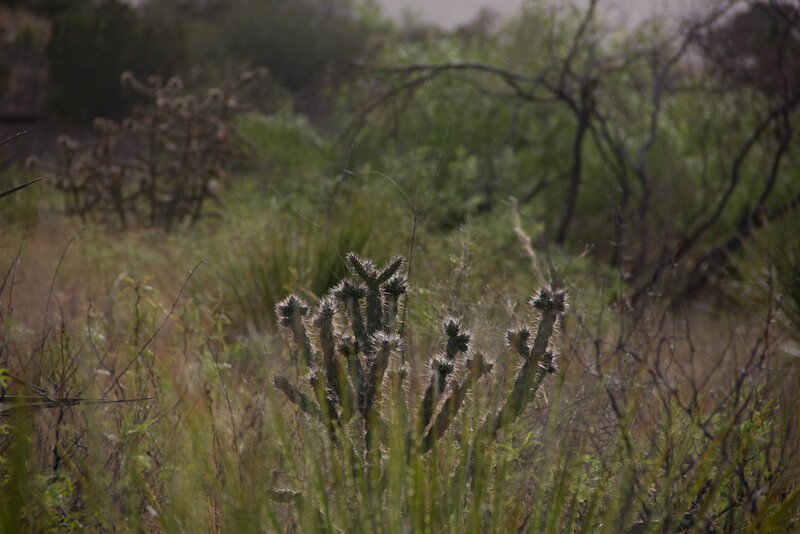 The second night in Marfa had given her sinuses what seemed like the final blow, so when we got to the park entrance flying dust was of particular concern. So we asked the ranger. The answers he gave us weren't exactly what we were looking for. He said things like, "oh yeah there's been a lot of dust there in the past days . . . but maybe it was smoke" and "sure, it's always windy up there". Driving towards Big Bend is a wholly uneventful affair. 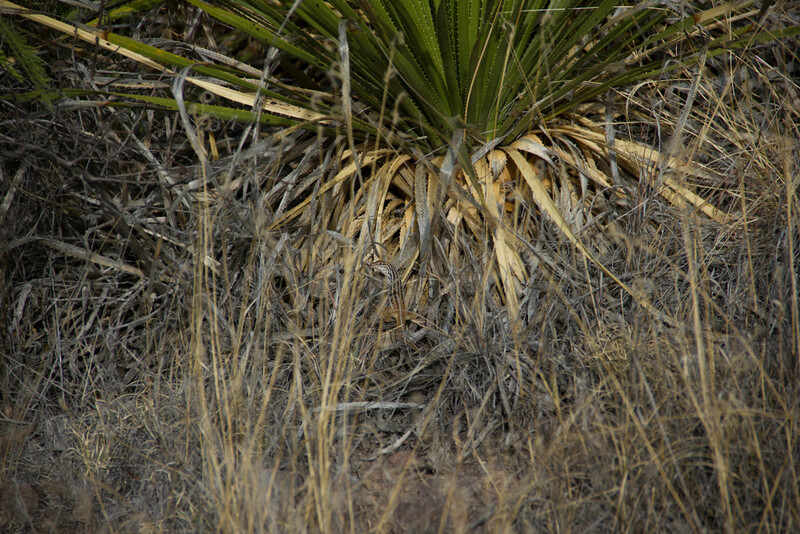 The landscape is a series of low rolling hills, with the occasional rift covered in grass, low shrubs and an occasional cactus. The only animals we saw were a few birds. 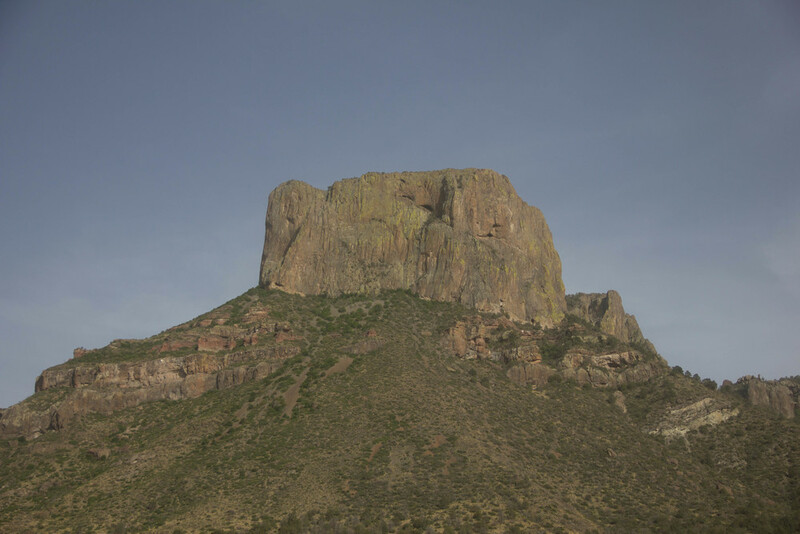 Part of Big Bend National Park's allure, is how remote it is. In the brochure we read that it is one of the most remote places in the lower 48 states. It doesn't come as a particular surprise then that I counted about 5 cars in the last 2 hours of our drive. When we reached Panther Junction both of us wanted to get out to stretch our legs, ask a few more questions regarding a few hikes we had our eyes on and to get our super awesome National Parks Passport stamped (some people have suggested that the passport is somehow lame and something for kids, but those people lack both imagination, spirit, and display a worrisome case of seriousness). 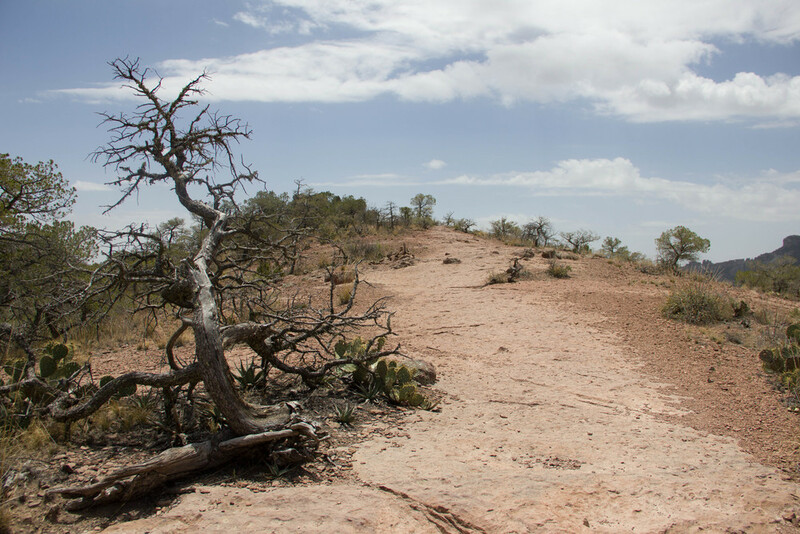 Once past Panther Junction, the landscape started to change dramatically. The air was filled with fine dust (or maybe smoke? let's just call it haze) so driving up the into the Chisos Basin was a little spooky, even though it was the middle of the day. Slowly one by one the mountains stepped forward out of obscurity. The last half hour we were flanked on both sides by huge 7,000 foot (and taller) mountains. Along a narrow and very windy road we made it up to the basin where our campground was located. Purely based on it's location, this campground was easily the most spectacular we'd been to. After oohing and ahhing for a bit, we set up our tent and then swung by the lodge to score some free Wi-Fi access to hopefully hear from our friends at Happy Mac in Austin. We didn't get an update and so we cooked dinner back at the campsite, decided to try to hike the Lost Mine Trail (tripadvisor!) in the morning, and then went to sleep. Hang on, there was one more thing: Before heading into the tent to sleep, I took some night sky pictures. I've been trying to polish my skills a bit in that department and I think they're getting better. Still, I admit there's a lot of room for improvement. I'm open for tips, by the way! In the morning we both agreed that we had slept much better and that there was no additional dust in the tent. The haze had cleared out of the atmosphere for the most part, too. Suddenly, we could clearly see all the mountains surrounding us in the basin. Bathed in the warm morning sunlight it was a sight to behold. While making breakfast, the high winds and extreme wild fire danger were worrying me. I literally covered the open side of the grill with my hoodie to prevent sparks from flying. I really didn't get a big enough bed of coals going. Additionally, I think the strong wind caused the coals to burn through much faster, so that in the end we didn't have hot enough coals for long enough to make eggs and coffee. After both of us were done stewing, we decided that enough was enough: we're gonna get a campstove. Encouraged by our own ability to face the music and move on we, uhm . . . moved on to break camp and head to the the Lost Mine trailhead. The trail starts out easy enough: it is wide enough for two people to comfortably walk next to each other and well maintained. This was our first long hike of the road trip, so that suited us just fine. 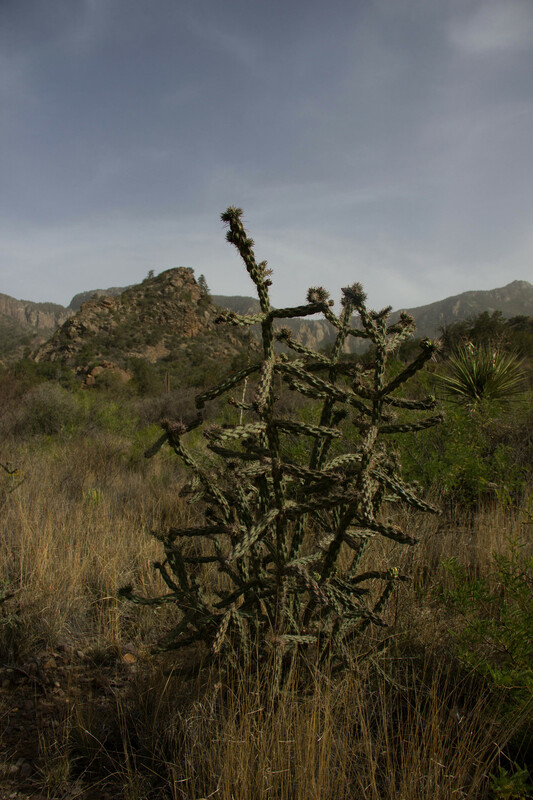 Aside from it's remoteness, Big Bend is also know for it's many native varieties of cacti, which bloom in the spring in fall. So we got to see a lot of different kinds, some of which were still in bloom. The trail really showed off once we reached the Juniper Canyon Overlook. Ahead of us, we could see deep into the Juniper Canyon and looking back over our shoulder we saw the trailhead and Chisos Basin with the campground and lodge. As we continued our ascent along and up the northeast wall of Juniper Canyon the views just grew more and more spectacular. Each switchback provided a new vantage point. Across from us we could see the majestic Casa Grande (which, coincidentally was also behind our tent site) and other peaks. We finally reached the end of the trail after about an hour and a half. However, the end of the trail in this case wasn't a peak, a singular point. Instead it was a drawn out ridge, the length of which we could walk from little peak to little peak. We could see into three different valleys and at least a handful of peaks and points rising around us. To top it off, we'd seen about a dozen or so people or so on the trail. In short, this was easily one of the most impressive views I've had and we both agreed that the ratio of visual pay-off to effort was steeply stacked in our favor. 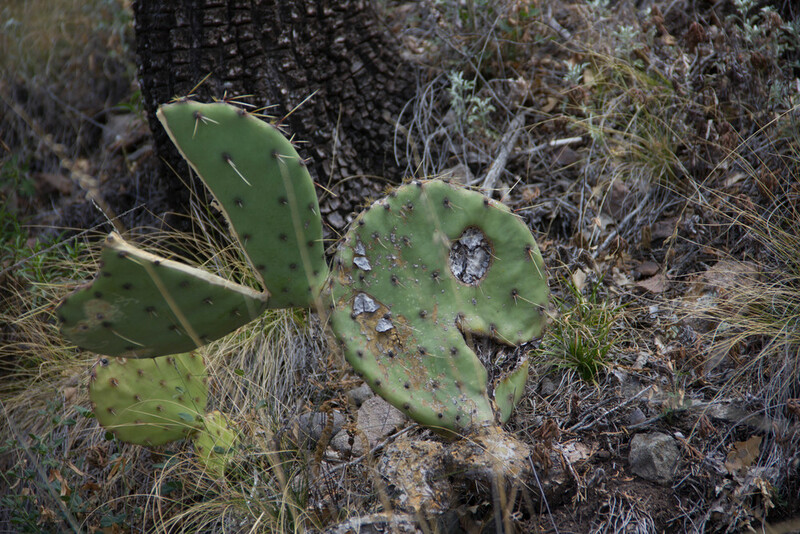 We sat there for a while, us and the desert mountains, and I thought about how wildly different nature out here was. How different it looked from the places in the Alps I used to hike growing up, or even the Appalachian range on the East Coast. Deeply satisfied, we began to descend. Not before long we were united again with the Omimobile and on our way towards El Paso, Texas. That's not technically correct: really we were headed for Santa Teresa, New Mexico since that's where Princess and a Kostya were getting married in only two short days! I was particularly excited to see those two get hitched, because Kostya is my oldest friend in the United States and he stood with me at our wedding. Now it was my time to stand with him at his. On our way there we stopped at Cattleman's Ranch, a short drive outside of Fabens, Texas for steak dinner. The steak was out of this world. I mean really, it was amazing. Peter L. (you know who you are), if you're reading this, you should take note. As always, if you want to see a few more pictures, head on over to the Flickr page!